We’d all like to think we’re at the top of our game, but there’s always something more we can do to be even better. How well have you and your marketing team prepared to respond to the challenges that lie ahead? 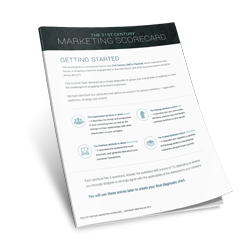 To find out how you rank compared to others, download our 21st Century Marketing Team Scorecard. This short assessment takes less than five minutes to complete, but the takeaways are so valuable we believe that will help shape your marketing strategy for the rest of the year.